I'd like to document recipes I use at home. Most of my cooking is the attempt to satisfy the taste buds of my husband and my son. 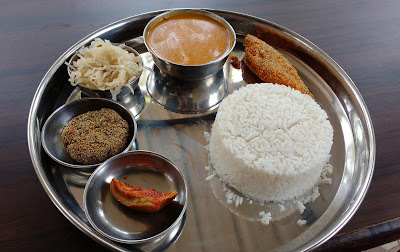 The cuisines are mostly South Indian (Malayalee mostly) and North Indian (Punjabi). As I learned cooking from a wide variety of people, so too I hope that my blog will help someone trying to mess around in a kitchen. As I also find myself surfing the net for food blogs most regularly I hope I can repay all the wonderful ideas I got by providing some of mine. Cabbage Soup - Please, Sir, may I have some more? I've always loved cabbage. In fact, I was not even deterred by mentions of it being a staple for prisoners in Siberia. Anti-Soviet writings were popular when I was quite young. The prisoners had to build their own camps, cut down trees and were fed just enough to survive, Simmeth said. "We were served one-quarter loaf of bread and cabbage soup," he said. Mostly, my mother made a dry cabbage and potato dish and it was tasty. 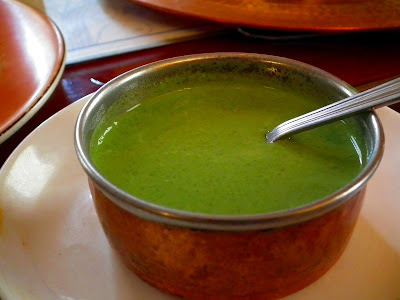 What is more, during my graduation years, I had a Gujarati friend who introduced me to a version from her region. Even so, it was much the same dish. 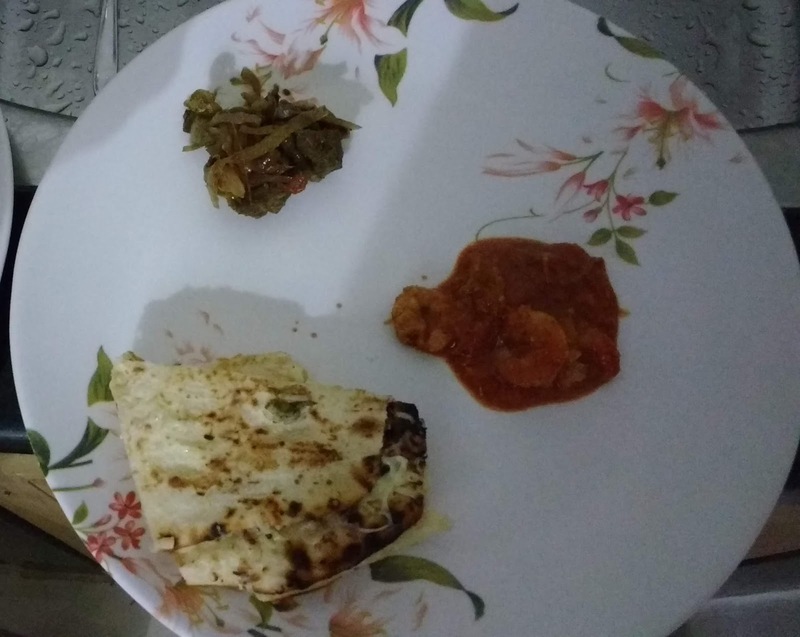 Of course, the South Indian dry dish, featuring only cabbage, must surely have been there and continues to hold a dominant position in my cooking repertoire. Cabbage, as coleslaw, came into my world with the then popular Nirulas in Delhi. Cabbage with channa dal and coconut was stirred into my life by marriage. And, all this time, the size of the cabbages I bought remained decent for a small family. Also, cabbage rapidly reduces in volume when cooked. However, somewhere along the way, the cabbage became gigantic. Where it was one of the easiest veggies to chop, even when the dish required mincing, cabbage now grew tough. At home, my partner and I often argue whether it is the region - Pune - or whether some tweaking has led to this unpleasant avatar. Whatever the reason, I struggle to use up cabbage now. Yet cabbage is a valuable vegetable. 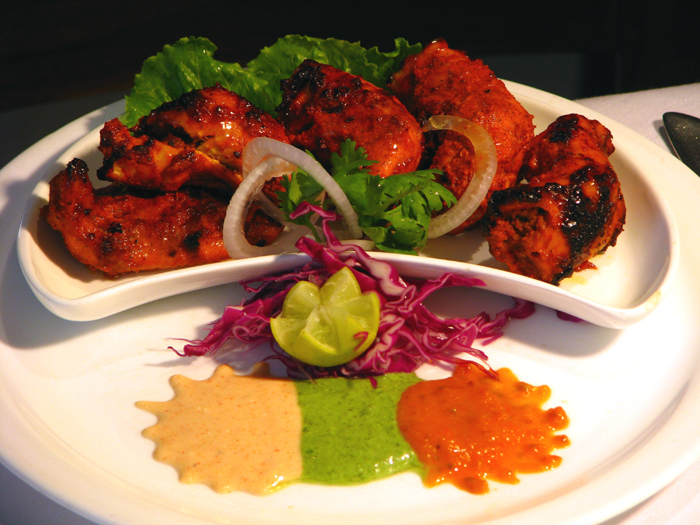 It is also versatile and adds delightful crunch to salads and to Indo-Chinese fusion dishes. Even with such a range of things one can do with it and with all its health benefits, I struggled hard to use up the one cabbage I would pick up per week. I even tried cabbage juice and it's really not so bad at all! Finally, being on a soup binge, I decided to go for this method. Only I can't quite imagine myself liking a clear soup with chunks or slices of cabbage. And so I chose the 'creamy' version. 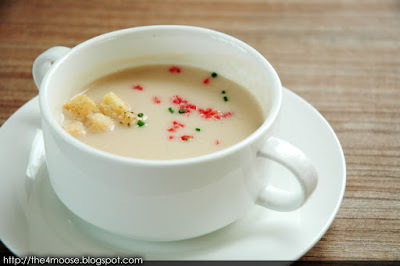 Richard Lee - Chef Daniel's Kitchen: Cream of Cabbage Soup. Saute the chopped veggies. Cool and blend. Boil with stock. Season. Cabbage juice, as I mentioned, is quite nice and when you make it and have it over the next day or two it sort of ferments and can be pleasantly but mildly fizzy. And the soup is soothing and sumptuous. Not at all like something served to prisoners! My first powerful memory of this vegetable is as halwa. I've never eaten such a dish again but it remains delicious in recall. Yellow pumpkin was never cooked by my mother so far as I can remember. And it is only much later that I understood why. In Delhi, I discovered that this gourd is called sitaphal there. For me, having grown up in South India, sitaphal was custard apple or sugar-apple as it appears to be called elsewhere. By now, I could see why my mother never cooked the vegetable. Shopkeepers were loathe to cut it, in those days, as once cut, the vegetable would rapidly degrade and spoil. And one gourd looks fit enough to feed a village as a whole! Somehow, I continue to be fond of this yellow fellow. 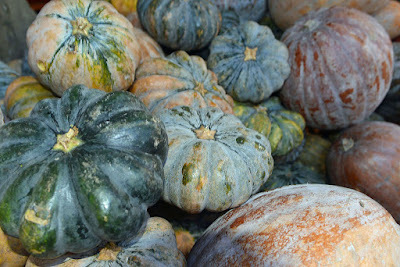 It is reported that yellow pumpkin has many antioxidants and can be good for health. And yet it is a vegetable that is hard to use up as most recipes require but a few pieces. There are, indeed, a good many Indian recipes that call for a goodly amount but, in our family, for example, it is only I who am partial to the sweet and sour bhopla preparation that is popular in the Hindi belt and features mainly the bhopla. There are diverse recipes from all over India and all of them can be very delicious but few use more than a few pieces of the vegetable. Moreover, here, the focus is on soup. I learned my technique from my sister who made it for me once. 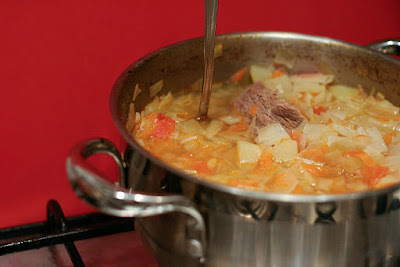 The recipe is not precise but it is easy and there's nothing like a bowl of this broth for a fine winter's day or night. Indeed, you can have it in any season. Chops everything coarsely and saute in some oil or butter. Pressure cook or boil until cooked. Cool and blend. I didn't really need to sieve it. Add about two cups of stock or water. Season with salt, pepper. A dash of cinnamon or nutmeg powder is nice and you can add a bay leaf or tej patta if you like. Boil for a bit. Serve hot. Now, that's my version but you can find many more ideas on the Net. A dash of lime juice or a bit of grated zest can make the soup fancy. These days one finds a huge variety of commercial soups in shops. They are great in a pinch but some contain chemicals that might not be so good for us. Also, it is a good habit to make things one eats from scratch. The engagement makes for more mindfulness. Often, when family is away, I delight in 'sloppy' cooking. A simple meal slap-dashed together. And that is why I enjoyed a Japanese drama called Hana no Zubora Meshi or Hana's Sloppy Meals. 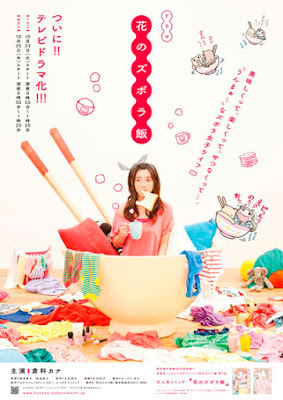 Hana no Zubora Meshi (Hana’s Sloppy Meals) is a popular josei (women’s) manga about a housewife who loves food, hates housework, and lets appearances slide while her husband’s away. (To be fair, his work keeping him away makes her a bit depressed and lonely, too, which isn’t a great motivator.) So she reads piles of romance comics and sleeps a lot, periodically emerging to do battle with the apartment or buy food. It's a real entertainer with a TV crew randomly intervening to comment on Hana's ways. Surprisingly, for all that this might sound boring, it's a show that goes down well. Basically comic, it targets the modern miss. And, indeed, all real women around the world. 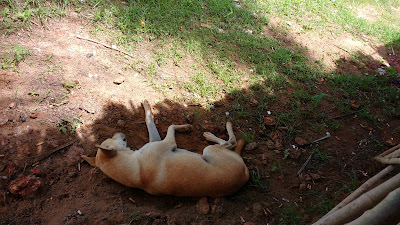 India boasts many a Madam Miraculous and I, for one, am delighted to find that we can also be as sloppy as the next Joe! So, until you get to watch the show, here are some recipes that were featured in the drama. Frankly, I might never get to taste these dishes but I do love watching food related TV dramas and the Japanese do a splendid job of it. As do the Koreans. The shows are worth watching for another reason: here are stories without violence or excessive tragedy but which yet engage and entertain! So, what's your secret sloppy meal recipe? At some point in time, the potato, once so popular, acquired a bad reputation: eating potatoes bred couch potatoes. People avoid the poor potato like the plague. But potato is hard to resist. Now, scientists say that potato need not be resisted: it can provide us with resistant starch. Resistant starch resists stomach conditions such as acid and reaches the gut where it nourishes good bacteria that protect us. From diabetics to those who want to lose weight, from people with chronic stomach infections to those with insomnia, many are those who can benefit from resistant starch. But what is resistant starch? The book is informative and laced entertainingly with anecdotes such as the one about the grandmother's potato salad. So, the theory is that there is something called resistant starch in some foods. And it is good stuff which gets enhanced in some foods - potatoes, rice - when we cook them and then cool them. It makes me wonder if that's what many Indian villagers in rice eating areas already knew as it was once habitual for them to eat leftover rice - left overnight in water - for breakfast. For those with chronic gut infections, the small intestine can have bacterial overgrowth. Nasty organisms flourish as medicines disturb the balance of gut bacteria. Also, tummy infections damage delicate linings, making us vulnerable to organisms the body otherwise easily resists. Research suggests that a moderate intake of resistant starch can bolster the chances for healthy gut bacteria. Of less interest to me is another bonus that some claim - resistant starch might be a good ingredient in a weight loss diet. Now, I do love my aloos! Also, I've read of potato salad and I imagine it to be like the Russian Salad I used to have as a child in Bengaluru. 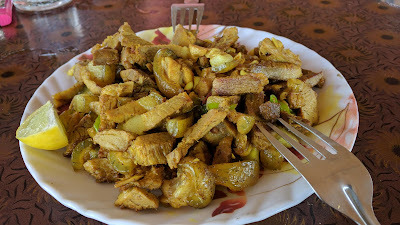 We, in India, have many variations of our own kind of potato salad. In fact, such a thing is probably the first dish I cooked in my life and that was sometime in the Seventies and it was a recipe from Femina! The one I made did not use mustard oil. I do not remember that it had any oil but mustard oil gives great flavour! However, I am opting for the other kind of potato salad and I plan to combine the boiled potatoes with a coleslaw as I have some excess cabbage on hand. Cabbages are too big these days! And cabbage also plays a helpful role for tummy health. In any case, we need some Mayo! Now, one could stop there but some folks put boiled eggs in their potato salad. However, mayonnaise has egg anyway and so I used chicken from a leftover chicken curry. The result was very yum! The much maligned potato now boasts benefits! Sandwiches Packed - Ready for Adventure! Sandwiches are very fancy, nowadays. 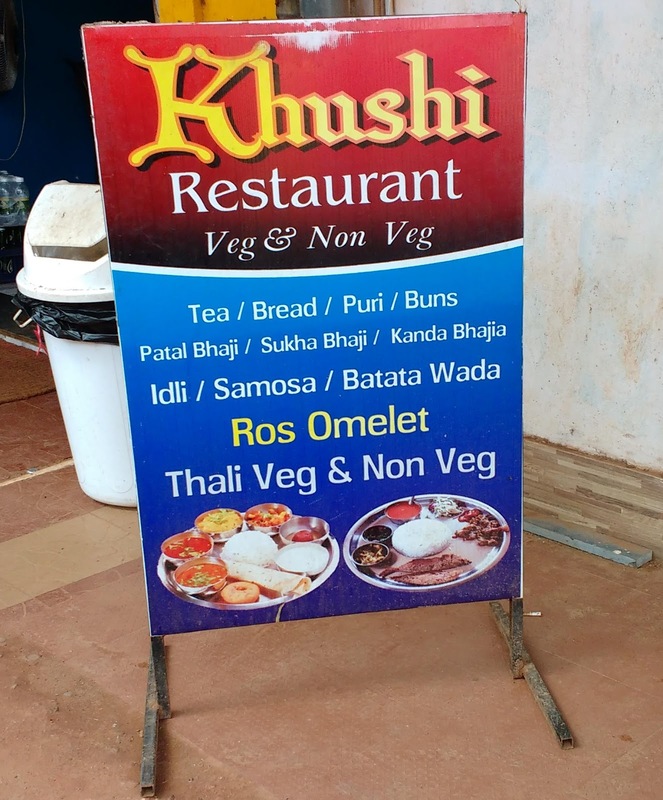 Many eateries specialise in them. However, it is easy to make simple sandwiches and they are splendid to pack for a lunch or for overnight travel. 1. Sliced bread that is not too fresh. This is because newly baked bread will only help the sandwich get soggier and it's also harder to cut neatly. 2. 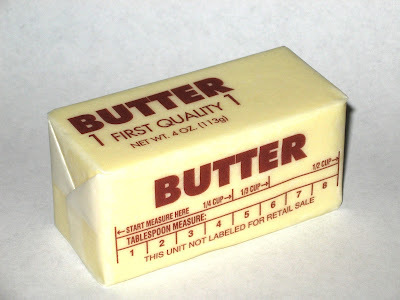 Butter or any other spread such as a green chutney, mayo, cheese spread and so on. 3. Condiments like salt, pepper - freshly cracked is divine - chili flakes or even some Indian masala powder such as Chaat Masala. One can even dribble some favourite Indian pickle over the filling. 4. Filings will depend on one's religious persuasion: vegetarian or not and other such taboos. 2. Egg - some vegetarians can live with eggs. 3. Deboned fish - tinned fish works well. You'd naturally need to have bread, butter, other spreads selected, condiments and the fillings at hand. Vegetables need to be washed well if they haven't already been cleaned. Cooked vegetables or meats need to be fairly dry. A 'curry' or gravy based dish may not be wise unless all the liquid is taken off. Keep the butter out of the fridge to soften well in advance and that will save time and struggle. Butter two slices of bread, each on the inner side only. Alternatively apply mayo or a chutney. A green chutney goes well for this sandwich. If the bread is quite dry and the chutney firm, the sandwich will hold well. 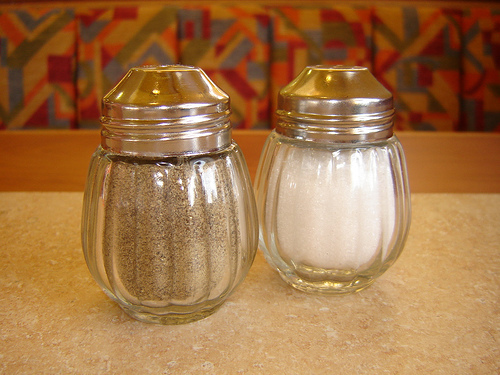 Season the bread with the spread with a dash of salt and pepper. Add a cheese slice if you like. Now add thinly sliced tomato - it may be wise to cut away the liquid portion with seeds. Use just enough so that there is just one layer. Season. Top with the other slice. One can add a few thin slices of cucumber too but then the sandwich may be hard to manage. A simple cucumber sandwich can be whipped up in much the same manner. These can have hard boiled eggs, omelets or scrambled eggs. 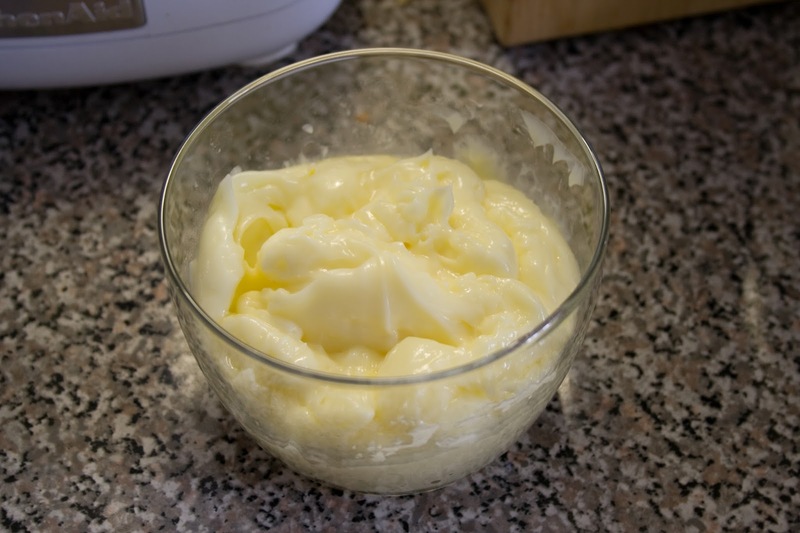 For the boiled egg, it appears a tradition to use mayonnaise. 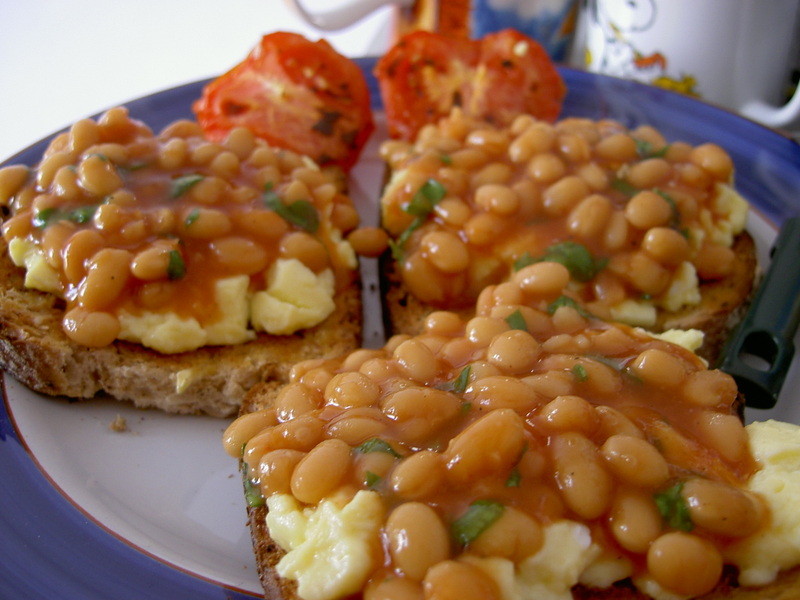 The simplest is the omelette sandwich where an omelette is the filling between buttered slices of bread. This was often my lunch when I was doing my post graduation. The same works for scrambled eggs, which are basically omelettes broken up into bits. The boiled egg sandwich can be as simple as the other egg sandwiches above with either butter or mayo as spread. Alternatively, one makes a kind of egg salad by coarsely mashing the boiled egg with mayo and other condiments and perhaps some crunchy bits of salad greens. Dry meat/poultry such as tandoori meats/fish or smoked preparations such as salami and ham go well in a travel sandwich. However, in a hot climate, only choose if to be eaten within the day. Make sure the fillings are hygienic and safe to eat. Do not overuse fillings or the sandwich will be messy. Finally, pack your sandwiches well with foil or cling film. Pack the packed sandwiches in a container so that they do not get crushed. Keep a lot of tissues handy to wipe greasy fingers clean. A flask of hot water and some tea premixes would be wonderful to wash this meal down. I wish there was a hot chocolate or Horlicks premix! For the more adventurous, pack a few tomatoes, cucumbers, boiled eggs, a loaf of bread, butter and/or a bottle of some spread, a knife and have a blast with the makings en route! Added baggage: a tin of tuna or baked beans to provide more occupational therapy! Midnight diners have always been popular with second show audiences and travelers in India. And we do have food shows which cover all kinds of places and phases of day. However, though we have a rich culture of food, we have few or no dramas or films where food is the main theme. And it was only when I started watching Japanese dramas that I found that they devote whole series to food. There are too many of them for me to list but I will introduce you to a few of my favourites. Let's start with Midnight Diner or Shinya Shokudo. The show is exquisite. With each episode, regulars and newcomers visit the Midnight Diner and each episode showcases a dish. We have Nekomanma in Episode Two. Since this 'cat food' - neko is cat in Japanese - is too simple, I cannot find a video of the recipe. The Butter Rice in Episode Five is, also, too simple and, so, let's move on to Katsudon, Episode Six. Midnight Diner has become quite a hit the world over and further seasons were released. It is interesting to note that, usually, a J dorama has no more than some eight episodes but their food dramas end up with many seasons. Last but not least the famous Omurice! Midnight Diner is on Netflix and I hope you'll watch it soon! Varca gets very rainy in June. And that is when we were there last. In fact, June is when we've been going there for the past few years. So we were well prepared. 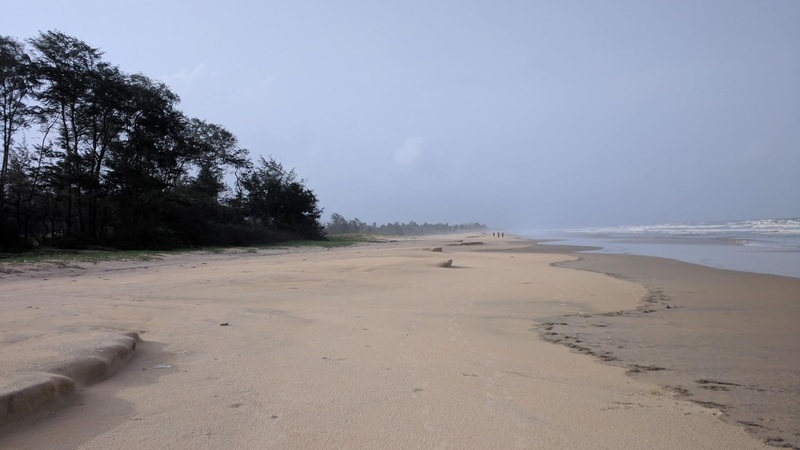 The area is not as tourist-oriented as other parts of Goa. And we spotted many unfortunate holiday makers marooned outside fancy resorts, caught in the sudden downpours that spell the season. All togged up, these people had nowhere to go with no transport to hire in sight. For us, there was no problem during the day. But, as the sun goes down, when heavy downpours are frequent, it's not fun to drive around, clad in raincoats! On earlier visits we have been to Kinara for dinner. 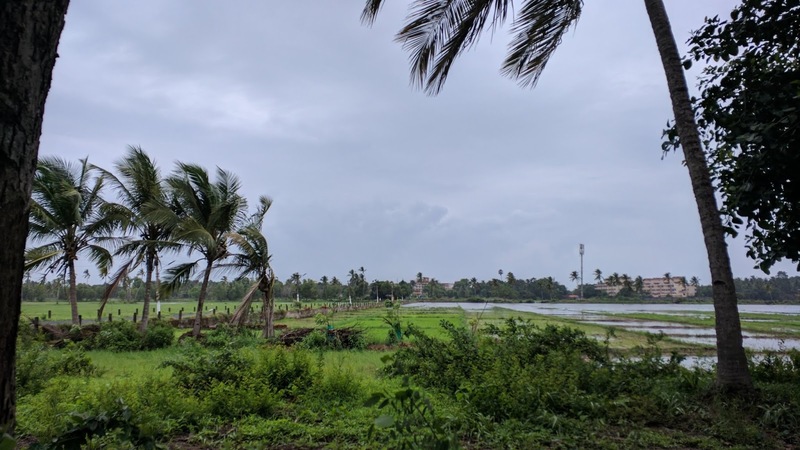 But, on that visit, the rains were not as frequent or as heavy as they were this June. Kinara is really handy for tourist or local alike. 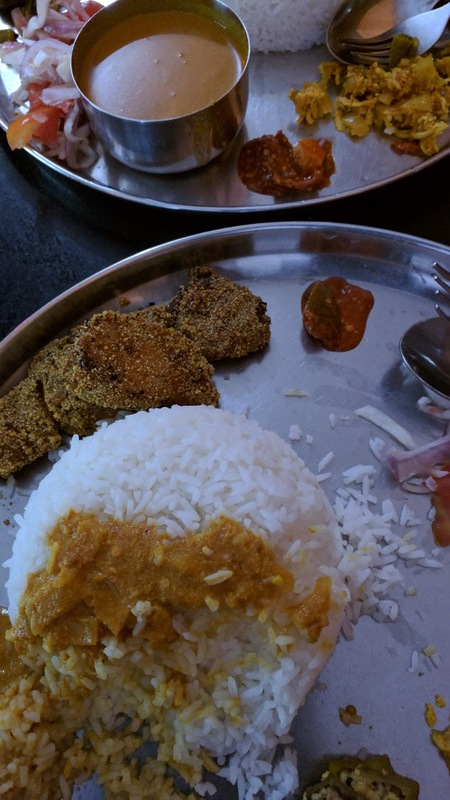 The little darling of a place has already found mention on this blog and, while it does deliver, we were a little outside the ambit this time. This time, however, we mostly ordered in. 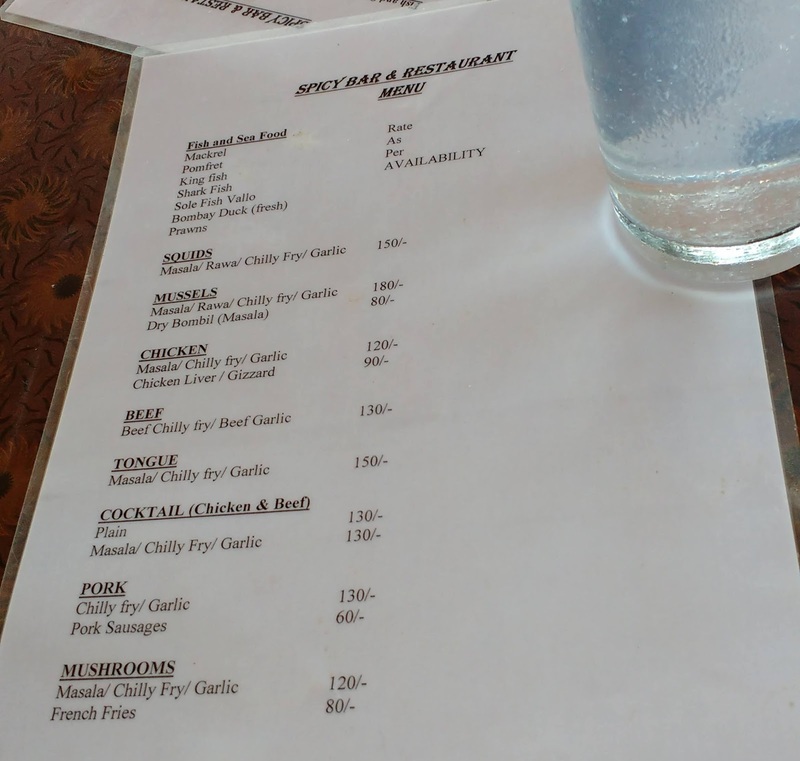 The hotel had two menus and those served us quite well for the duration. I have not visited either place but the food was hot and tasty and wonderful for the wet weather. We could catch a film on our laptop whilst munching away and, outside, it would be raining cats and dogs mostly. Feed More was one such. However, it opens for orders only at 8 pm and the delivery is slightly slow. So, we mostly ended up ordering from Vicksunn Food Point. For the two of us, as we eat lightly, it came to a little under Rs 200. We ordered butter naan or garlic cheese naan and one was more than enough for us at our age. The main dish would be chicken or fish. Looking at the map I wonder if this place used to be called Arturos. A couple of times, we brought back dinner from two popular food carts. The Moses Orlim fast food center is pretty famous. When we went there, it was around six in the evening and there was a goodly crowd. Mostly locals and a few tourists like ourselves who had discovered this gem off Google Maps. Families and groups of friends were ordering like there's no tomorrow. 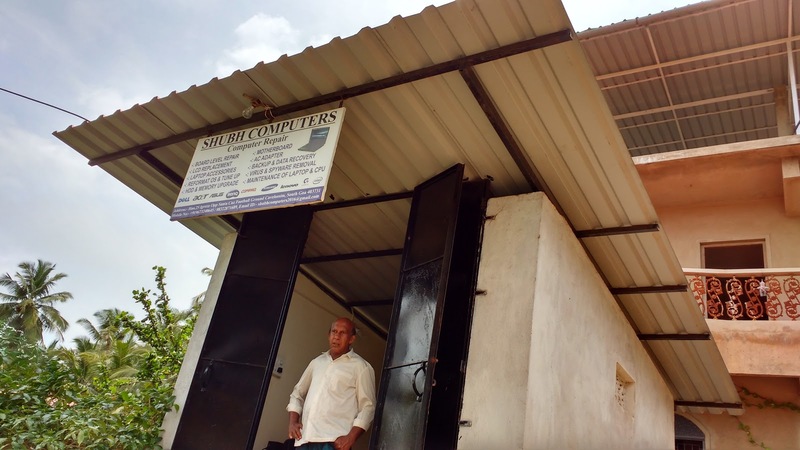 A set of ladies had come all the way from Calangute, more than an hour away! They have all kinds of fillings and we chose a couple. There are all sorts of condiments to garnish the finished creation and, as we watched them in action, we chatted with a couple of young boys working for one of the hotel booking sites. Another day, we got some food packed from a food truck that comes and parks near the road in the evenings. It basically has foods similar to the Moses Orlim fast food center. 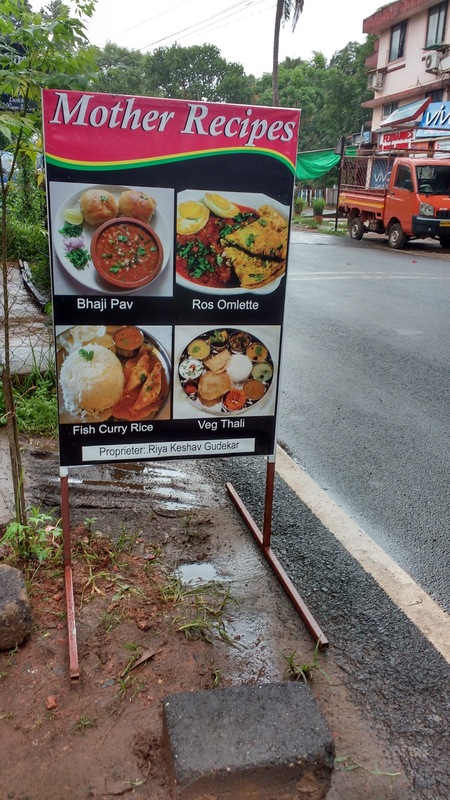 It's opposite Cowboy's Family Restaurant, which we've not tried yet though it was recommended by a fellow shopper at Magsons Gourmet, a great little supermarket in Varca. 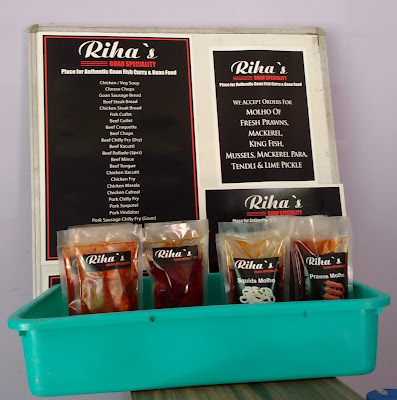 With a little effort one can even imagine getting something from there and whipping up an easy dinner at the hotel, since many now do keep some basic cooking arrangements. And that is the fifth option that I can give you - we used leftovers from lunch and with the microwave and the stoves provided it's easy to have a tasty and filing meal. Now dinner's done, we shall loiter around Varca one last time, in search of snacks for the monsoon. Cheers till then! Forest bathing is in vogue, a panacea to the many ills of modern life. If there's no forest in sight, paddy fields do the trick as neatly. Spicy Bar, Carmona, nestles amidst these verdant stretches. The soothing silence is only now and then punctuated by a rare passing motorist on the narrow, but not straight, little road that runs through the fields. Now and again, a man will holler at his buffaloes or dogs will break into barking. 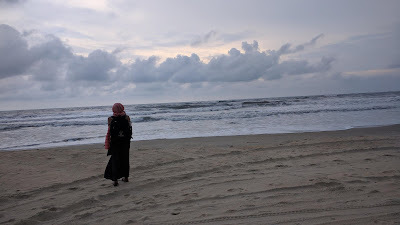 But, as for most of the time, it's only the birds and, perhaps, the sea. Indeed, one day, a cyclone was announced and the winds were quite breezy with their tunes. At other times, we, or other patrons, played some music off our phones. Sometimes, people spoke to each other but, otherwise, there is such an air of sanctity there that one reduces words and becomes lost in the sound of one hand clapping. 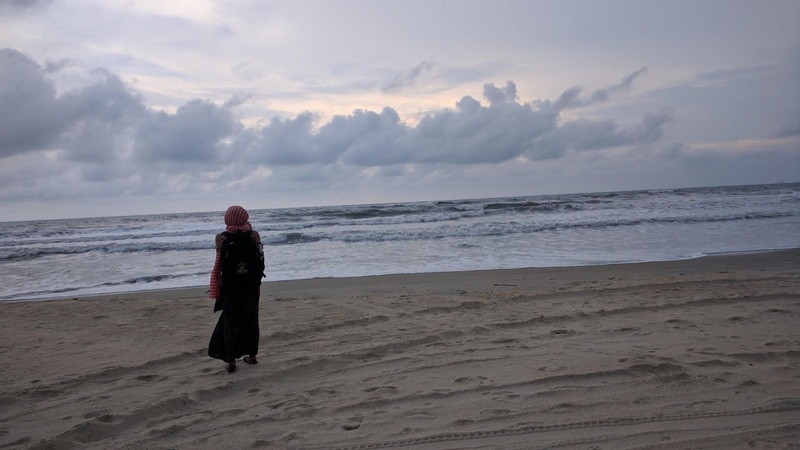 Our days in Varca, this June, often began with time on the beach. The area has splendid stretches of spotlessly clean sand and mornings saw blissful walks along the shore. After that, a warm shower, some hours of work and off we set for Spicy Bar. Besides the three meals of the day, we often enjoyed a snack at Spicy Bar. The owner is a dog lover and feeds the lot that loll around with buns. However, that does not mean it's gone to the dogs! We had a couple of other dishes and sometimes had to ask to doggy bag leftovers. And that took care of a dinner or lunch. We met some very nice people at the Spicy Bar. First and foremost is young Maruti who serves with a handsome smile and who is, basically, the sole engine of this shrine. We also met people who live in and around Carmona and they were kind enough to recommend places to eat at. I would say that it would be hard to find such civil human beings at other such places in India. This place holds a special place in my heart and it is now our third trip to Varca and the charm grows! After this short sacred ritual, we'd be off for lunch - and you can read about those in a previous post. It is these modest little places that turn out to be gems, not the gaudy, expensive, and noisy tourist traps. When I surf for places to eat I mostly find overpriced joints targeting tourists or catering to local tastes for the exotic. These experiences are not so bad in themselves: you can get a fancy dish that is, probably, worth paying the extra for and local tastes do amazing things to tired repeats of popular cuisine from around the world. However, for the cost, the risk of getting an indifferent tasting mess is overwhelming for me. And experience confirmed the worst over the years. I'm sure there are many like me, in this respect, all over the world and so, you will find in the next post on this blog, I discovered a couple of places thanks in part to the marvellous Google where folks are prone to mark favourite eateries. 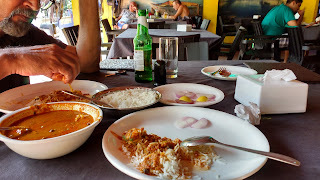 I chose, especially during this visit, to eat at places favoured by locals. To avoid the category that includes the genre local-exotic, I had to make bold and greet and ask locals for recommendations. 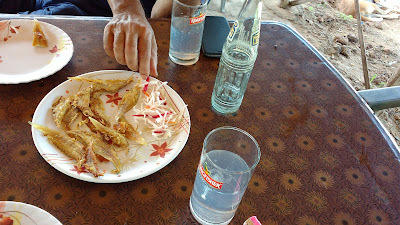 Mainly, this occured at the divine moments spent in Spicy Bar, as you will discover in an upcoming post here. 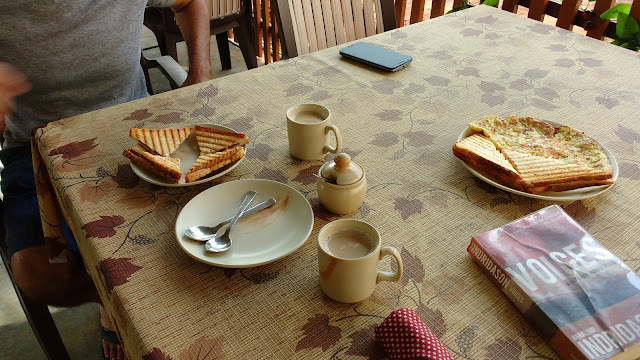 With 8 Breakfasts in and around Varca under the belt, we now explore eight lunches there. 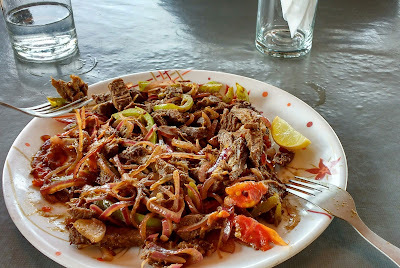 The last time we were in Varca, we'd been told to try Ayis Place, near Cavelossim Church, facing the Cavelossim Sports Club Hall, but we somehow were always too early. As we were the first time on this trip too and so we circled back and discovered Khushi, a little place right next to the Varca Church. 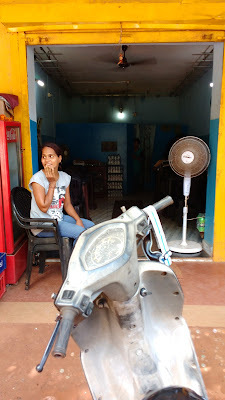 It's small and unassuming but cheerful thanks to Sudha who smilingly serves you hearty, wholesome homemade food. 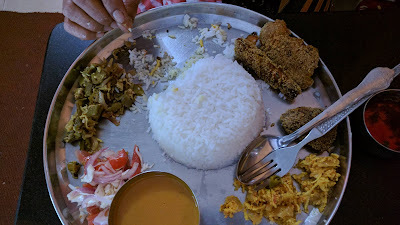 We had a fish thali - a fried fish, a fish in a curry, some veggies and a kokum drink. 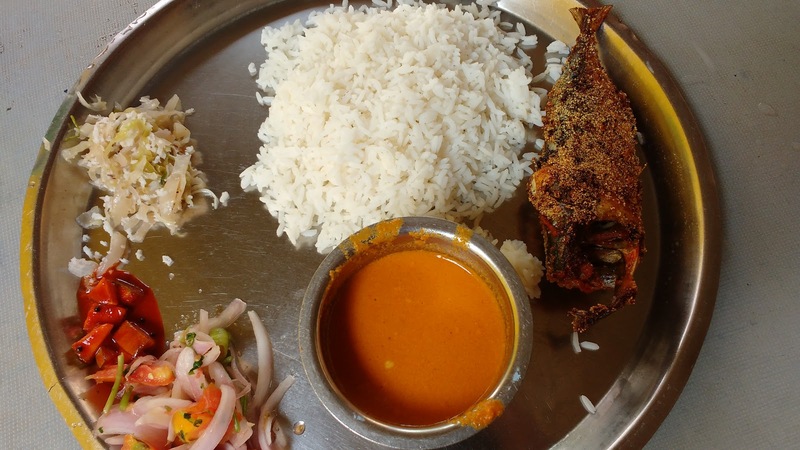 This is the usual pattern of the Goan fish thali in the area. It's not terribly fancy but the fish is always very fresh. Good food gets polished off before there's time to take a snap! The next day we made sure to reach Ayis in time and it was a splendid experience. 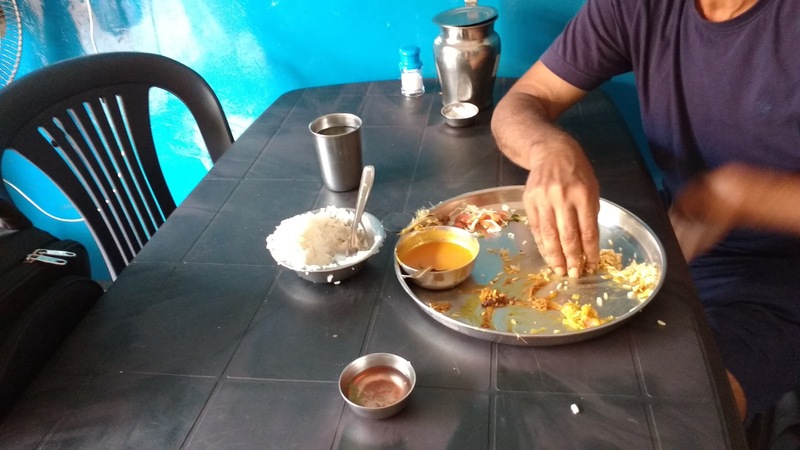 The family-run place soon got full of locals and the food was hearty and tasty. 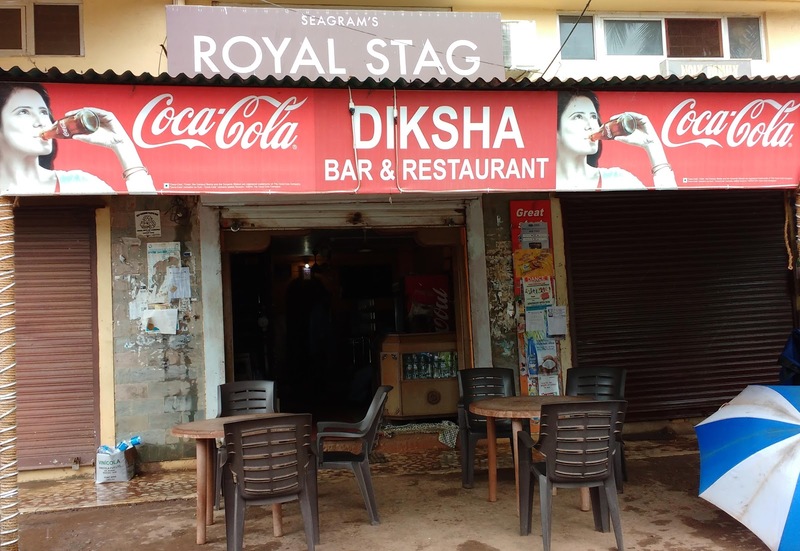 On the third day we finally ate at another place, recommended by locals on our previous trip: Diksha. The food was so very good. This is also a family run place. And it's really clean and comfy inside. The day after, we decided to try Mother Recipes which we'd noted on an afternoon drive. It's a little after the petrol bunk, to the right. This is also a family run place, and, indeed, feels more so than the others. It is cosy and can get crowded at lunch time as it is popular with the people in the area. The next day we decided to lunch at our old favourite in the area: Kinara. 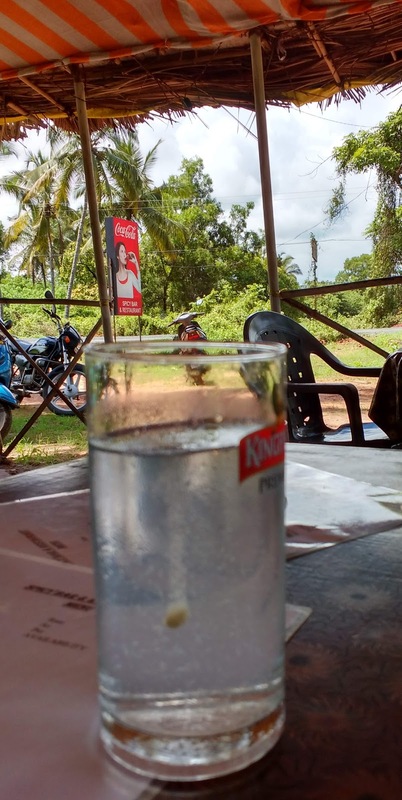 Kinara is a safe bet for the tourist and the little place has a big heart. 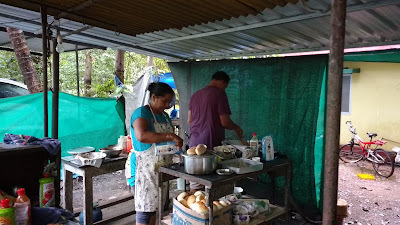 The food is always good and it's a relaxing place to sit at - you can watch the lazy road, or catch some TV or just browse the rest of the clientele - a mix of locals, and tourists, national and international. 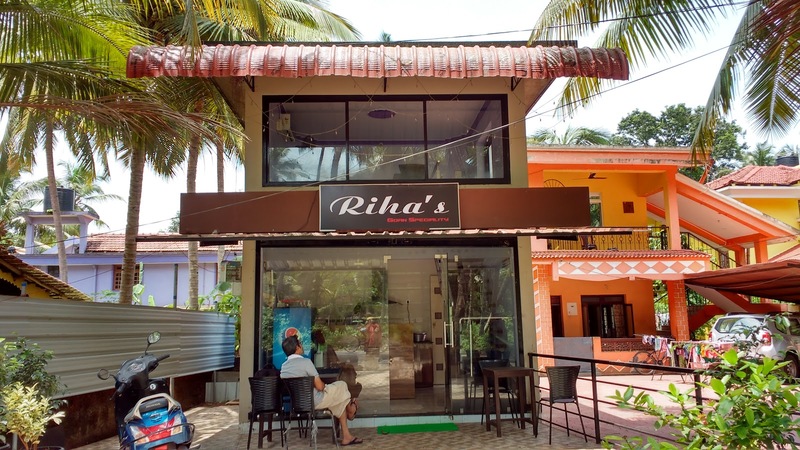 Riha's is new and it was a fellow tippler at Spicy Bar who tipped us off about it. I look forwards to more visits to all these places on future visits. Riha's is also run by a local family and will appeal to all, nicely situated on the main road. On one day, we used the leftovers from dinner as lunch - we've not gone so far as to cook for ourselves but I do plan that for a future trip: Cooking up a storm in a teapot - Goa on a Budget. Not so far fetched when I recall being told, at one hotel an year back, not to boil milk in the electric kettle.